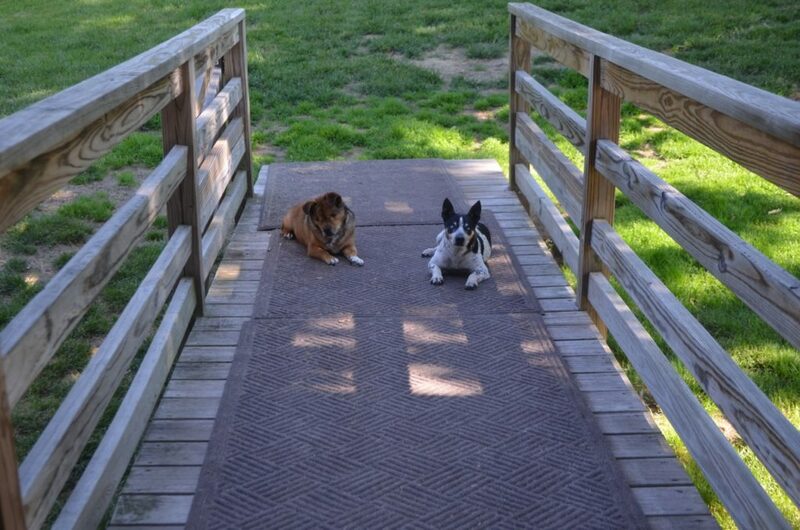 Alayne took this photo yesterday afternoon of’the two blind boys, Bugsy and Taco, enjoying hanging out on the ramp in the shade. We have a magnificent oak tree that provides a lot of much-needed shade on hot summer days to both the front yard and a large part of the house, and the dogs sure take advantage of it. That was probably the coolest spot on the farm yesterday! With the July 4th holiday next Monday, we’ll be taking a blog break and will resume posting the following week. Those mature oak trees are all most as precious as the Rolling Dog Farm residents. So nice that they can enjoy the shade, as well as you and Alayne. I do hope you’ve got a porch chair out there somewhere!! Ah, it’s a wonderful life for these guys! Hope you and Alayne have a great holiday, including time to rest a bit in the shade yourselves. They’ve got a great spot to relax and get out of the heat!